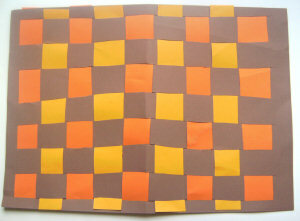 This placemat in Autumn colours makes a fun seasonal table decoration which the kids will enjoy weaving. Cut the paper into strips about 1 inch wide. Take a strip of paper and pass it under the card and then up through the first slit, down through the second and back up through the third and so on until you reach the other side of the card. Push it up so it sits as close to the top of the brown card as it can reach. Repeat with a different coloured strip of paper, starting the other way, down through the first slit and up through the second and so on. Repeat until the card is full.